Mumbai, July 25, 2018: According to recent industry reports, 156 mn. of Indians who comprise the ‘urban mass’ and urban middle’ section representing an annual income of USD 3000 and above have the potential of mass adoption of consumer credit. Of this the ‘urban mass’ constituting approximately 129 mn. have been mostly deprived of credit due to lack of credit history. 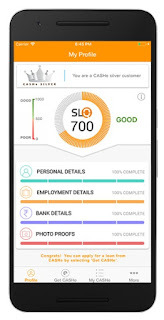 Addressing this major concern, CASHe, India’s leading digital lending company, promoted by serial entrepreneur and private equity investor Mr. V. Raman Kumar, today announced the launch of India’s first alternate credit rating system – ‘The Social Loan Quotient’ (SLQ).